The OG Land Rover, and I mean the first one which had been missing for decades, has apparently been found. 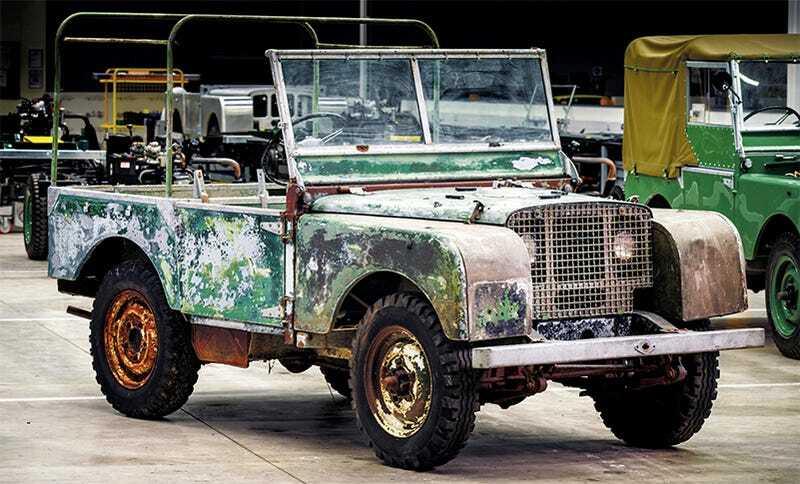 Land Rover’s restoration specialists say it was hanging out in a garden down the road from the company’s Solihull, U.K. headquarters after a long life of sitting in other piles of dirt. This year, the trucklet’s being restored. Land Rover celebrates its 70th anniversary in 2018 and has decided to commemorate the occasion with the resurrection, which Jaguar Land Rover Classic Director Tim Hannig describes as a “sympathetic restoration”, of this vehicle. I think what he means is that his team will be very, very careful to keep the rusty septuagenarian as period-correct as possible while making it pretty again. I think we can rest assured that this will not be a budget buggy build involving Saw-Zalls and a lift kit. Land Rover Classic Works, one of the coolest shops in the automotive industry right now, painstakingly restores all manner of old Rovers to their original specifications. This will, clearly, be the oldest thing they’ll work on, since it was built for the 1948 Amsterdam Motor Show at which Land Rover was introduced to the world. What an event that must have been. It seems that 48 of these original original Land Rovers, which were really pre-production prototypes, were built around the same time. This one, according to Land Rover, ended up being registered and presumably sold to somebody in 1955. The vehicle was then resold in 1961, then moved around England in 1965, 1967 and 1968. In ’68 the Rover was reportedly retired to duty “as a static power source” in Wales until its engine seized in 1988, at which time it was moved to Birmingham by a new owner with ambitions on a restoration project that never got off the ground. Now that it’s in the hands of Land Rover’s historians and mechanics, I think the vehicle will be returned to its former glory as properly as possible. I’m sure many of you are torn between whether this thing’s “field life” patina should be preserved. I can’t decide either, but I do think it’s pretty cool that Land Rover was able to track this truck down. The project will be fun to watch. If you can’t wait to get started, here’s a brief but beautiful video of the ’48 in the shop. You’ve got to love the bathtub faucet knob under the hood. Time to Rove some Lands again.